When Schmidt’s brewery closed in June 1987 after being bought by Wisconsin brewer G. Heileman, Philly officially switched from a beer-producing to merely a beer-drinking city. Although Schmidt’s wasn’t a taste explosion (my dad used to refer to it by a similar sounding expletive), the demise of the Northern Liberties brewer that once fermented a million barrels a year was a sign of the consolidation of a once thriving local industry. In the 19th century up until the early 20th, our city was home to over a hundred breweries; there’s even a whole neighborhood, Brewerytown, named for our beer-making past. Prohibition killed some of them, and the rest died out or were bought by larger competitors. Recently, that trend has begun to change. With the craft beer boom of the past decade, Americans have rediscovered the varied tastes of specialty beers, which are often brewed and sold locally. Philly has seen its share of brewpubs and microbreweries in the past few years, and now boasts two production breweries: Yards and the Philadelphia Brewing Company (PBC). Yards was founded in 1994 in a Manayunk garage and has since grown from a three-barrel operation into Philly’s preeminent craft brewer, producing 1,000 barrels a month. 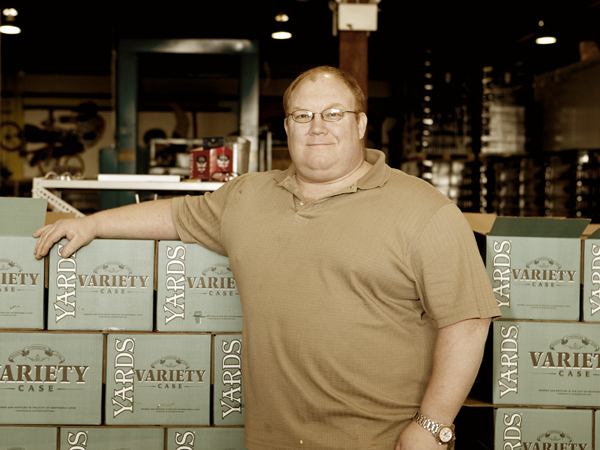 Tom Kehoe, co-founder of Yards, like many craft brewers, started discovering different beers in high school. “I was getting into the dark imported beers,” he says. “I came across an Anchor Steam [one of America’s first microbreweries, located in San Francisco] and I tried it and thought, ‘Wow, I guess there isn’t any reason you can’t have a really flavorful beer made in the US.’ ” Inspired, he started making his own beer in college and, after working at a microbrewery in Maryland, made the jump into production brewing. Since then, Yards has moved twice, landing in 2008 at a new spot on Delaware Ave., and become a staple at many local bars. Philly also has numerous brewpubs that make and sell their own brew, like Nodding Head, Triumph, Earth Bread + Brewery, and Dock Street, and a robust crop of regional microbreweries, like Stoudt’s, Victory and Flying Fish. These new businesses produce a variety of unusual beers that actually have flavors other than the washed-out moldy bread taste of the big brewers, and are often tied in some way to our area. Yards produces a series of historical beers with recipes from Revolutionary times, like the rich and smoky General Washington Tavern Porter, and their hometown-named Philadelphia Pale Ale, which won an “excellent” nod from the New York Times in 2006 for its strong hoppy flavor and crisp finish. PBC has the Rowhouse Red, a full-bodied red farmhouse ale that references our predominant housing style, and the Walt Wit, a Belgian-style white beer named for the local poet. Local craft brewing is a growing concern, too. It’s a 5.1 billion dollar industry that grew 6.5 percent by volume and 11 percent in dollars from 2006-07. Also, the number of regional craft breweries grew from 49 to 53 and microbreweries from 359 to 392 in the same time period. And even with a sinking economy causing failures in other sectors, the alcohol industry, for obvious reasons, is usually recession-proof. Aside from different tastes, clever names and the boost to our local economy, there’s something else that draws people to local beer: a link between a craft, a place, and the people who made it. Something that ties together the history and future of a place into that special feeling you get when you realize that an area is your home. Philly’s craft beer industry rose out of the home brewing culture of an unknown number of basement bottlers—people who liked to make new and interesting beers for their friends and family. Some are members of the Homebrewers of Philadelphia and Suburbs, a local club that often meets at Home Sweet Homebrew, a brewing shop on Sansom St. Walk into the charming Homebrew and you’ll not only smell a rich, bready mixture of grains, but meet two fat, dusty orange cats, Jake and Elwood. George Hummel and wife Nancy Rigberg have run the shop for 22 years, well before craft beer was widely available or produced. They’ve seen the craft beer boom raise people’s interest in home brewing, and oddly enough, occasionally hurt their sales. Bill Covaleski, of Victory Brewing Co. in Downington, followed his passion for making something that was his own into a successful local brewing company. “In 1985, I was a recent graduate of the Tyler School of Art and I borrowed my dad’s home brewing kit,” he says. “I enjoyed it so much that I wanted to make it my real job.” After training in the industry he helped start Victory in 1996. The other brewer actually in town, PBC, is one of the youngest of the local craft brewers. PBC was founded in 2007 by Nancy and Bill Barton, who formally co-owned Yards with Kehoe. When the two groups split, PBC kept the Kensington brewery building, which historically was home to the Weisbrod & Hess Brewery, while Kehoe kept the Yards name. Although PBC’s much younger as a standalone company, they have quickly made a name for themselves in Philly with their distinctive retro labels, strong commitment to local promotion and support of projects like Greensgrow Farm, farmer’s markets and Sustainable Table, an online resource for sustainable living.